Luscious Legumage , originally uploaded by arahbahn. So, the cupboard had some lima beans in it, and I had to use ’em. I even put them there, in my “project make myself eat beans because they are good for me.” I’d been afraid of beans for too long. Mom supplied a recipe, one from Cooking Light for “Luscious Lima Beans,” and I’ll be darned if it didn’t look truly luscious, burbling away for 2+ hours. Actually, about half the beans in this were some dried fava beans (check them out here, for a visual) that I picked up at Seward Co-op. Those were about as exotic of a bean as I could find, locally, though perhaps I just need to keep looking, or look at a different time of year than fall or winter. Truly, the greatest variety of beans I’ve seen thus far, locally, was at El Burrito Mercado, though I am a little wary of the packaging. The high-volume, low-style plastic bagging seems to infer to me, even if incorrectly, that those beans aren’t very fresh. I’ll have to investigate further, as quite a few of them still looked worth a try. I do like cannellini and the Mercado appears to be one of the few places that sells them, in dried form. The fava were intriguing because they were large and the hulls seemed to be sort of peeling away from the rest of the beans. And they had a lovely chestnut color, as well. Why did I have limas in my cupboard, when lima beans are the one food that I know I dislike? I suppose I bought them in a moment of need for color: I was shopping on the Purcell Mountain Farms site, and their “Christmas Lima Beans” looked just beautiful, with their burgundy/white appaloosa-like coloring. Plus, I’d seen a recipe in one of our cookbooks that indicated I should use Christmas Lima Beans. I very anxiously awaited the hour when I could try the soup. Both kinds of beans doubled in size during the soak and the cooking. They were silver-dollar size! And the aroma was quite lovely, though partly attributable to the mirepoix whose allium varieties included leeks and shallots. Alas, I finally got a taste last night for dinner. And oh, the disappointment! Those limas were as pasty and chalky as the re-heated small green frozen ones (you know, from the carrot/pea Birds Eye mix) that Mom used to feed us. I’m a texture fiend, and these just ruined it all for me- the favas weren’t a whole lot better. It seems that I prefer my beans creamy. The soup is tasty enough that I can probably bring myself to help finish the batch, but we won’t be keeping this recipe. Ah well. Stay tuned for my next adventure in cupboard excavation. Luckily, everything else in there is stuff I like. What can I do with maraschino cherries? Or quinoa? I’m with ya. The only things in the bean family I can tolerate the flavor of are black beans and red lentils, the latter of which I prefer because they take 5 minutes to cook! 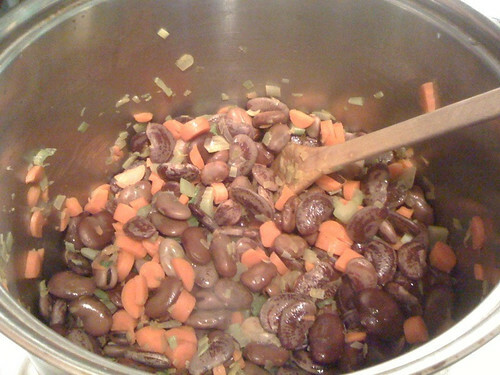 The black beans are slightly sweet and not very “beany” and available canned, so they too require little prep. The one I’ve never tried is fava; think they’d go well with chianti and…. oh dear, lost my appetite. I toss quinoa with steamed or roasted veggies — a nice variation from rice. And the maraschino cherries? That’s easy: lots and lots of brandy manhattans.